Warm up a winter’s day with an early evening concert on the theme of love. 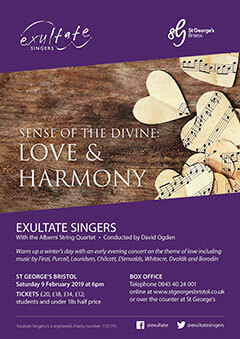 Exultate Singers is delighted to be joined by the esteemed Alberni String Quartet to perform passionate music for choir and strings by British and American composers influenced by the sensual words, songs and sounds of other cultures. With an early start at 6pm, there's even time for dinner à deux afterwards, as the concert will be finished by 8pm. The Alberni String Quartet has been considered one of Britain’s foremost chamber ensembles for over half a century. The Alberni’s long and distinguished history has allowed an incomparable wealth of experience and maturity to be passed down through the players as its line-up has evolved with the passing of time. Karin Leishman and Matthew Souter are long-standing members, and the quartet is now undergoing another of its periodic episodes of change and rejuvenation with the exciting appointments of cellist Richard May and the violinist Victoria Sayles.